Ahlam Shibli, untitled (Dependence no. 1), Barcelona, Spain, 2007, gelatine silver print, 38 x 57.7 cm. Saturday evening Catholic Mass, for the Filipino community in their native language,Tagalog. Església de Sant Agustí Nou, Plaça de Sant Agustí, el Raval, Barcelona, 11.7.2007. Ahlam Shibli, untitled (Dependence no. 2), Barcelona, Spain, 2007, gelatine silver print, 38 x 57.7 cm. 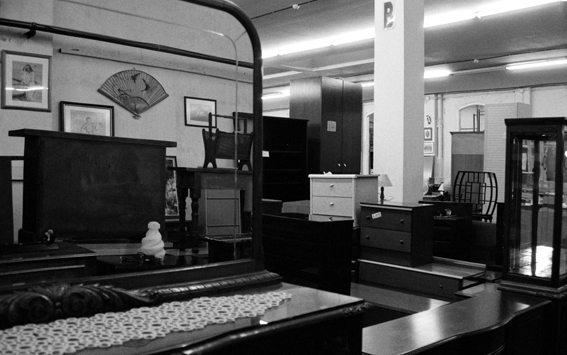 Second-hand furniture shop at Fundació Formació i Treball (fit), an organisation for social assistance. Carrer de Cristòfol de Moura, Poblenou, Barcelona, 12.11.2007. Ahlam Shibli, untitled (Dependence no. 3), Barcelona, Spain, 2007, gelatine silver print, 38 x 57.7 cm. Wednesday afternoon food delivery by Servei Solidari i Missioner dels Caputxins de Catalunya i Balears (ssim). Església de Pompeia, Av. Diagonal, Eixample, Barcelona, 18.7.2007. Ahlam Shibli, untitled (Dependence no. 4), Barcelona, Spain, 2007, gelatine silver print, 38 x 57.7 cm. 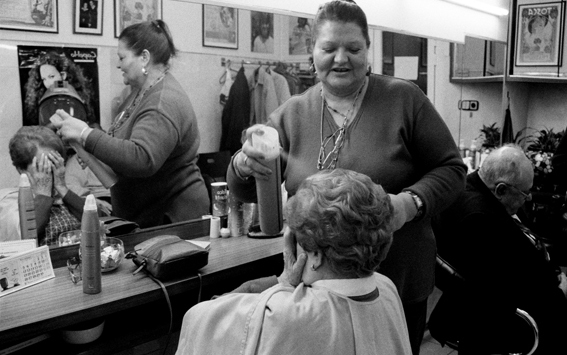 Ms Roser Saladrigues having her hair done at Perruqueria Bell Art. Carrer de Mònec, Barri de Sant Pere, Barcelona, 13.11.2007. Ahlam Shibli, untitled (Dependence no. 5), Barcelona, Spain, 2007, gelatine silver print, 38 x 57.7 cm. 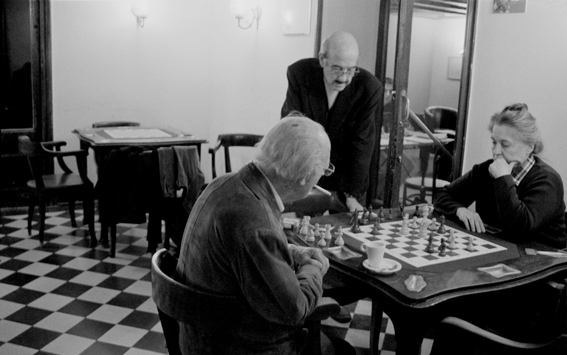 Mr José Manuel Deó Ridruejo playing chess with his friend, Ms Teresa Ventura, while Mr Manuel Jacas observes the game, at Ateneu Barcelonès. Carrer de Canuda, Casc Antic, Barcelona, 10.11.2007. Ahlam Shibli, untitled (Dependence no. 6), Barcelona, Spain, 2007, chromogenic print, 38 x 57.7 cm. 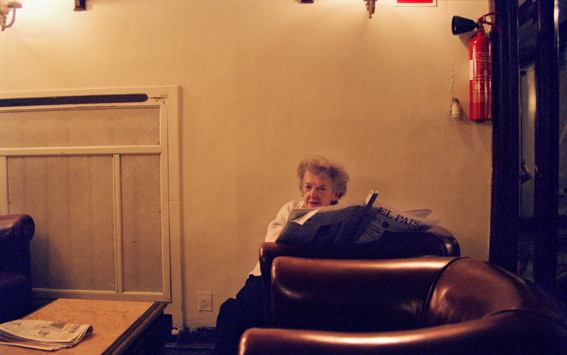 Ms Montserrat Baulida reading the newspaper at Ateneu Barcelonès. Carrer de Canuda, Casc Antic, Barcelona, 23.11.2007. Ahlam Shibli, untitled (Dependence no. 7), Barcelona, Spain, 2007, chromogenic print, 38 x 57.7 cm. Mr José Manuel Deó Ridruejo with his friends on the terrace of Ateneo Barcelonès. Carrer de Canuda, Casc Antic, Barcelona, 10.11.2007. Ahlam Shibli, untitled (Dependence no. 8), Barcelona, Spain, 2007, chromogenic print, 38 x 57.7 cm. 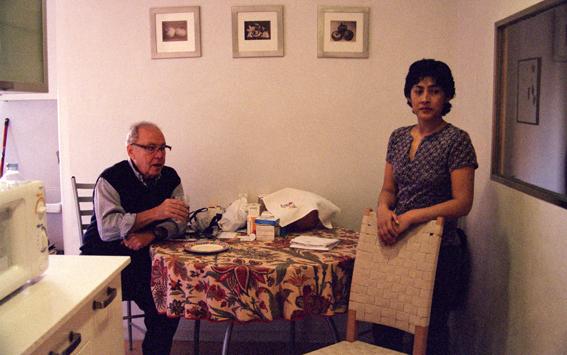 Ms Dulce María Maradiaga Fiallos, from Honduras, with her employer, Mr Rafael Pena, in his sitting room. Carrer de Bac de Roda, La Verneda, Barcelona, 8.7.2007. Ahlam Shibli, untitled (Dependence no. 9), Barcelona, Spain, 2007, gelatine silver print, 38 x 57.7 cm. 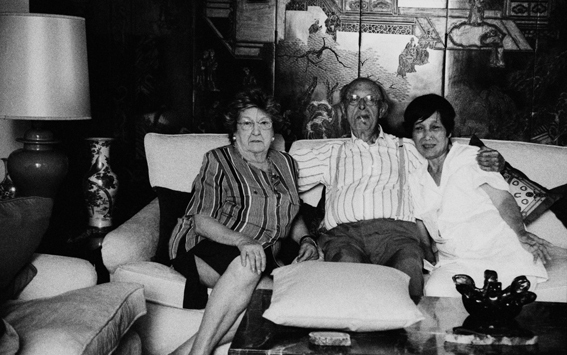 Ms Manin Robles, from the Philippines, with her employers, Mr José Manuel Deó Ridruejo and Ms Carmen Valera, in their sitting room. Passeig de Sant Joan, Eixample, Barcelona, 23.7. 2007. Ahlam Shibli, untitled (Dependence no. 10), Barcelona, Spain, 2007, chromogenic print, 38 x 57.7 cm. 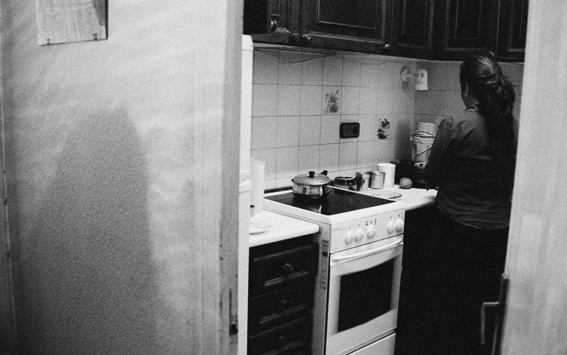 Ms Maria, from Bolivia, with her employer, Mr Jordi Suñé Oliveras, in his kitchen. Carrer de Casanova, Eixample, Barcelona, 18.11.2007. Ahlam Shibli, untitled (Dependence no. 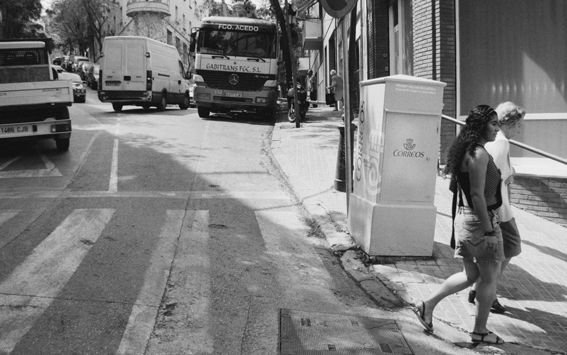 11), Barcelona, Spain, 2007, gelatine silver print, 38 x 57.7 cm. Ms Miriam Haydee, from Ecuador, with her employer, Ms Florita Alonso doing shopping for their lunch. Corner of Carrer de Roca i Batlle and Carrer de Suïssa, Sarrià-Sant Gervasi, Barcelona, 24.7.2007. Ahlam Shibli, untitled (Dependence no. 12), Barcelona, Spain, 2007, chromogenic print, 38 x 57.7 cm. Ms Olga Silvia Quilligana Guachi, from Ecuador, with her employer, Ms Josefa Cheto Mahiques, during their daily walk in the park. Plaça de l'Escorxador, Eixample, Barcelona, 6.7.2007. Ahlam Shibli, untitled (Dependence no. 13), Barcelona, Spain, 2007, gelatine silver print, 38 x 57.7 cm. 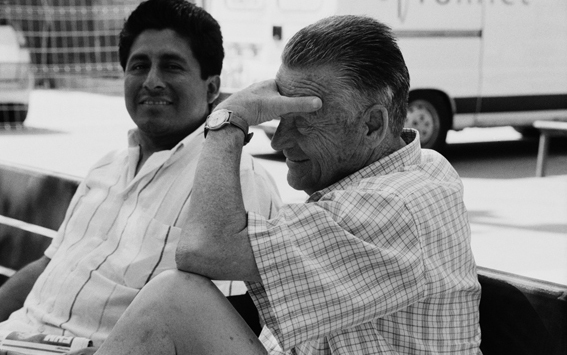 Mr Carlos Cueller, from Bolivia, with his employer, Mr Manuel Ballesteros. Plaça Dr. Duran i Reynals, Eixample, Barcelona, 16.7.2007. Ahlam Shibli, untitled (Dependence no. 14), Barcelona, Spain, 2007, chromogenic print, 38 x 57.7 cm. Ms Carmen Izquierdo, from Castellò, Spain, with her employer, Ms Núria Gali, on their way home from shopping. Carrer de Marmellà, Sant Gervasi, Barcelona, 25.7.2007. Ahlam Shibli, untitled (Dependence no. 15), Barcelona, Spain, 2007, gelatine silver print, 38 x 57.7 cm. 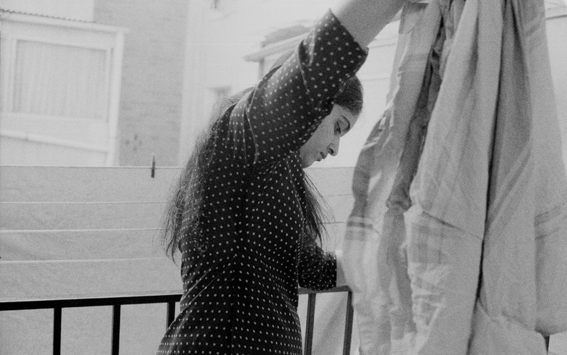 Ms Samreen Asad, from Pakistan, hanging out the laundry at the flat of her employers, Ms Julia Sánchez and Mr Carlos Roca. Carrer de Sostres, Vallcarca, Barcelona, 12.7.2007. Ahlam Shibli, untitled (Dependence no. 16), Barcelona, Spain, 2007, chromogenic print, 38 x 57.7 cm. Ms Eugenia, from Argentina, cleaning the bathroom of her employers, Ms Pilar Morales Vila and Mr Oleguer Galí Figueras. Carrer del Doctor Roux, Sarrià, Barcelona, 27.7.2007. Ahlam Shibli, untitled (Dependence no. 17), Barcelona, Spain, 2007, gelatine silver print, 38 x 57.7 cm. Ms Consuelo Álvarez Rodríguez, from Peru, preparing dinner for her employers, Ms Pilar Morales Vila and Mr Oleguer Galí Figueras. Carrer del Doctor Roux, Sarrià, Barcelona, 24.7.2007. Ahlam Shibli, untitled (Dependence no. 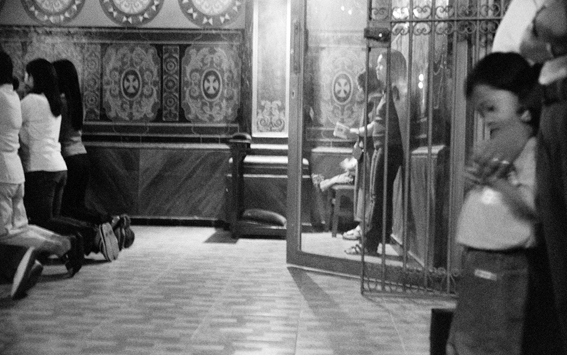 18), Barcelona, Spain, 2007, gelatine silver print, 38 x 57.7 cm. 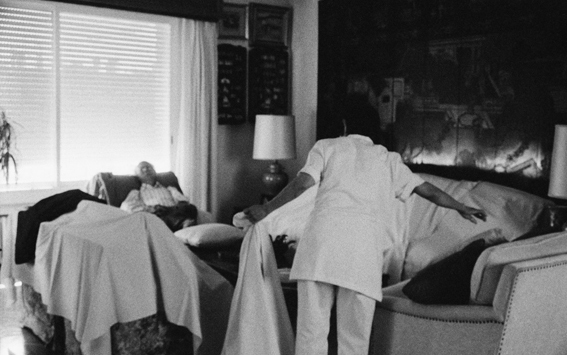 Ms Manin Robles, from the Philippines, covering the sitting room furniture with white sheets before her employers, Ms Carmen Valera and Mr José Manuel Deó Ridruejo, leave for their summer holiday. Passeig de Sant Joan, Eixample, Barcelona, 23.7.2007. Ahlam Shibli, untitled (Dependence no. 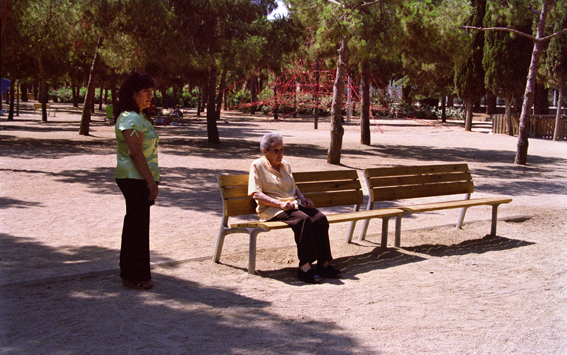 19), Barcelona, Spain, 2007, chromogenic print, 38 x 57.7 cm. 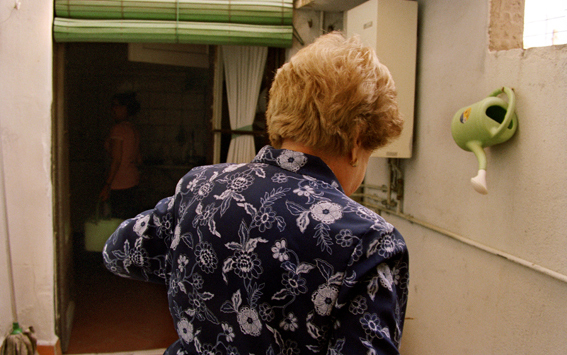 Ms Roser Saladrigues watering the plants on her kitchen terrace, while Amina, her employee from Morocco, cleans the kitchen. Carrer de Trafalgar, Barri Sant Pere, Barcelona, 31.7.2007. Ahlam Shibli, untitled (Dependence no. 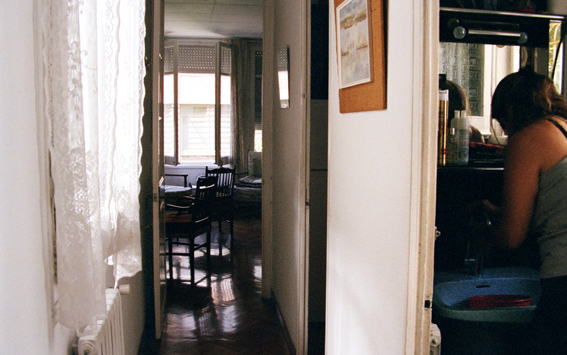 20), Barcelona, Spain, 2007, chromogenic print, 38 x 57.7 cm. 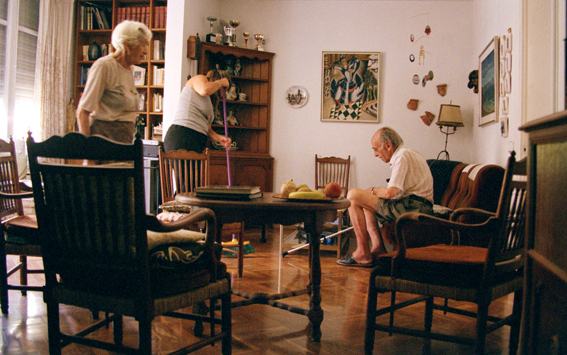 Ms Eugenia, from Argentina, sweeping the sitting room of her employers, Ms Pilar Morales Vila and Mr Oleguer Galí Figueras, also in the room. Carrer del Doctor Roux, Sarrià, Barcelona, 27.7.2007. Ahlam Shibli, untitled (Dependence no. 21), Barcelona, Spain, 2007, chromogenic print, 38 x 57.7 cm. 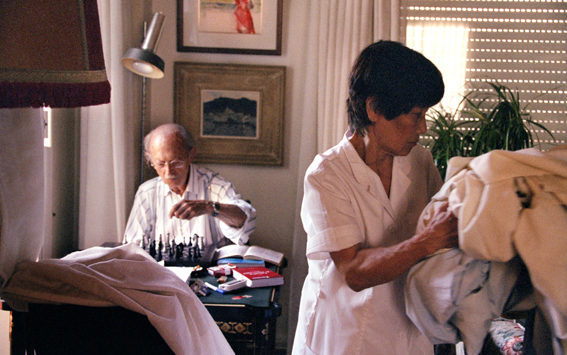 Ms Manin Robles, from the Philippines, carrying white sheets used to cover the living room furniture before her employers, Ms Carmen Valera and Mr José Manuel Deó Ridruejo, leave for their summer holiday, while Mr José Manuel Deó Ridruejo plays chess. Passeig de Sant Joan, Eixample, Barcelona, 23.7.2007. Ahlam Shibli, untitled (Dependence no. 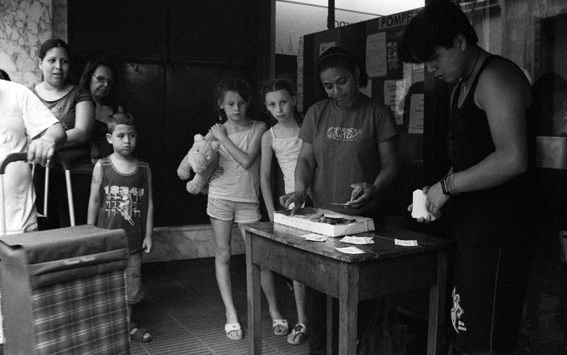 22), Barcelona, Spain, 2007, gelatine silver print, 38 x 57.7 cm. 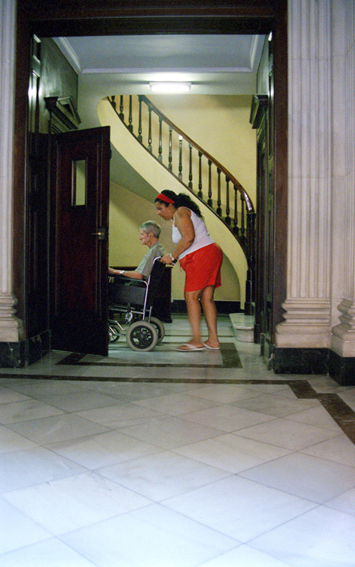 Ms Irina Suñé showing her family photographs to her employee Ms Maria, from Bolivia, who looks at them while cleaning the sitting room floor of her employers. Carrer de Casanova, Eixample, Barcelona, 18.11.2007. Ahlam Shibli, untitled (Dependence no. 23), Barcelona, Spain, 2007, gelatine silver print, 38 x 57.7 cm. 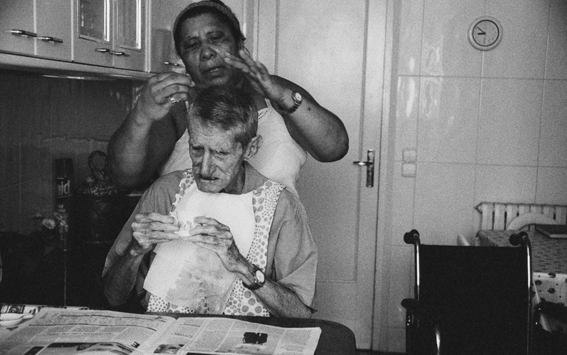 Ms Patricia Moutero Mediuc, from the Dominican Republic, combing the hair of her employer, Mr Enric Garcia Pus, while he is having his morning coffee and reading the newspaper. Carrer de Craywinckel, Vallcarca, Barcelona, 23.7.2007. Ahlam Shibli, untitled (Dependence no. 24), Barcelona, Spain, 2007, chromogenic print, 38 x 57.7 cm. 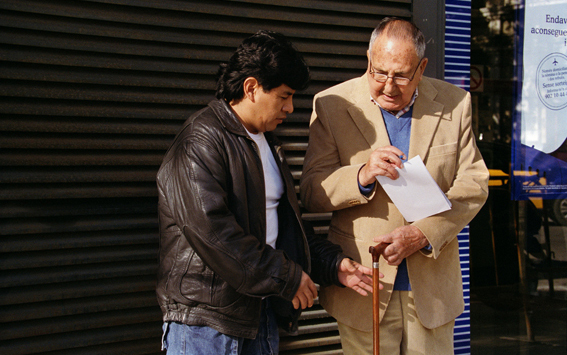 Mr Victor, from Ecuador, taking the cane of his employer, Mr Francisco, in order to free him to write a note, at the corner of Carrer de Casanova and Carrer de Còrsega, Eixample, Barcelona, 15.11.2007. Ahlam Shibli, untitled (Dependence no. 25), Barcelona, Spain, 2007, chromogenic print, 38 x 57.7 cm. 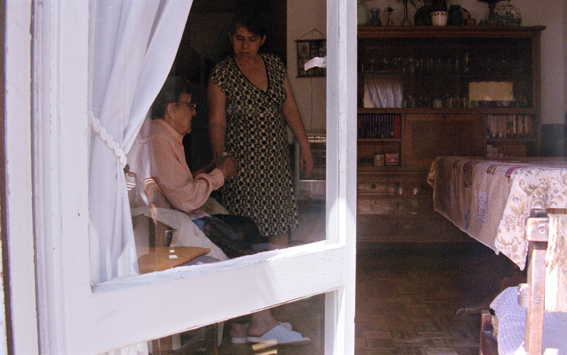 Ms Maria Milagros Velázquez de Guzmán, from El Salvador, serving a glass of water to her employer, Ms Leonor Plandolit Casaballó, in her sitting room. Carrer de Bertran, Sant Gervasi, Barcelona, 23.7.2007. Ahlam Shibli, untitled (Dependence no. 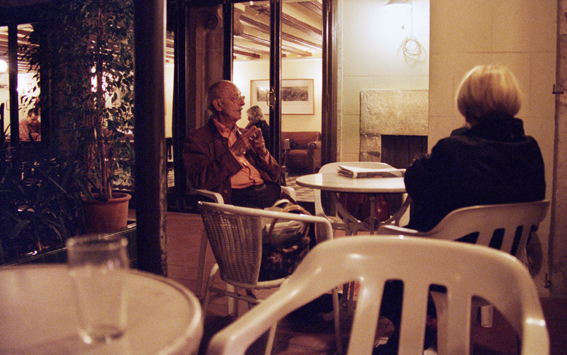 26), Barcelona, Spain, 2007, chromogenic print, 57.7 x 38 cm. Ms Patricia Moutero Mediuc, from the Dominican Republic, and her employer, Mr Enric Garcia Pus, returning to his home after their daily coffee break at the Cortacans coffee shop. Carrer de Craywinckel, Vallcarca, Barcelona, 23.7.2007. Ahlam Shibli, untitled (Dependence no. 27), Barcelona, Spain, 2007, chromogenic print, 38 x 57.7 cm. 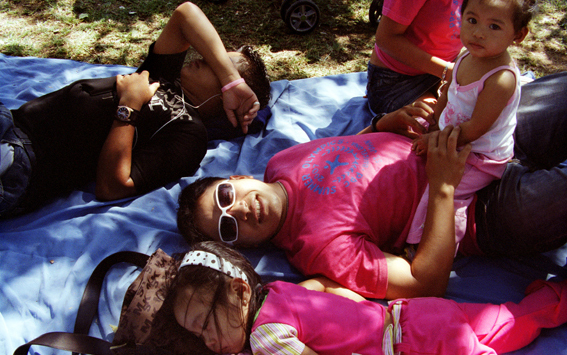 Father and daughter having a nap during a family sports day for the Filipino community organised by Centro Filipino in Barcelona. El Prat de Llobregat, Barcelona, 4.8.2007. Ahlam Shibli, untitled (Dependence no. 28), Barcelona, Spain, 2007, chromogenic print, 38 x 57.7 cm. Father, daughters and a friend taking a break during a family sports day for the Filipino community organised by Centro Filipino in Barcelona. El Prat de Llobregat, Barcelona, 4.8.2007. Ahlam Shibli, untitled (Dependence no. 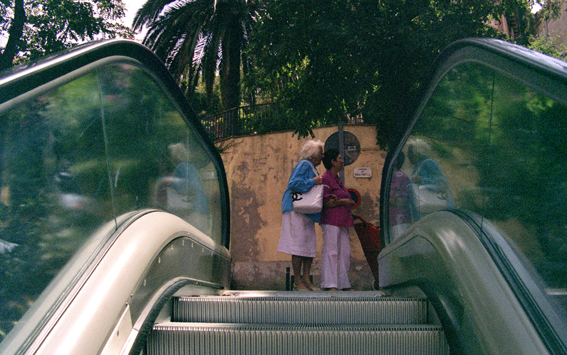 29), Barcelona, Spain, 2007, chromogenic print, 38 x 57.7 cm. 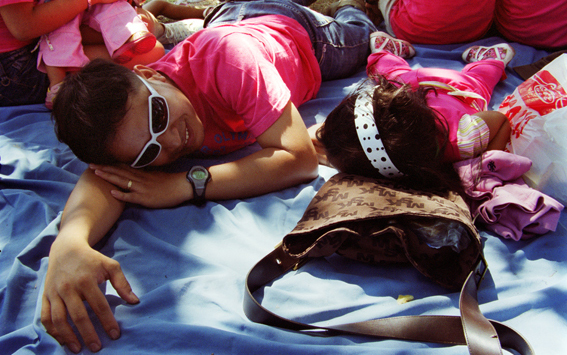 Noon nap during a family sports day for the Filipino community organised by Centro Filipino in Barcelona. El Prat de Llobregat, Barcelona, 4.8.2007.